The series that covers Jim’s travels is entitled “Wanderings And Sojourns” and presently comprises three volumes. 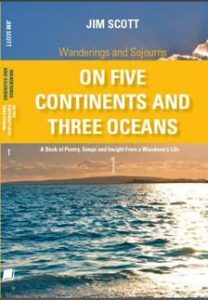 Book One “On Five Continents and Three Oceans” contains 24 short true stories about adventures and experiences afloat and throughout many countries of the world, including India, Morocco, Rhodesia (as Zimbabwe then was), Peru, Canada, Portugal, Antigua, Gibraltar, Bahamas, England…… after each story are a few words of reflection upon lessons learned and philosophies earned from the experience recounted. Interspersed between the stories are 28 original poems and songs on as wide a variety of subjects as the stories themselves; from sea shanties to eulogies, philosophy to plain tom-foolery. Names have deliberately not been used in any of the stories, although some characters will be recognizable to some readers. Some views discussed in the reflective paragraphs may be controversial, but they, none-the-less, stand as the result of the real life episode about which the particular story was lived and written. To read excerpts from book one click here. 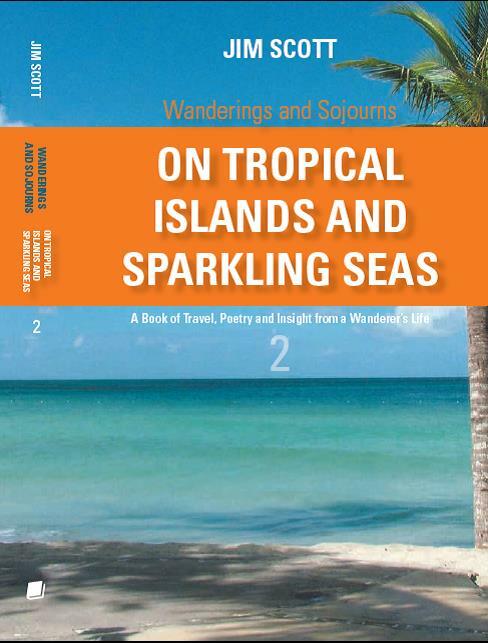 Book Two, “On Tropical Islands and Sparkling Seas” copies the format of the first but the focus of this volume is, as it’s name suggests, islands and sailing. This one will appeal to all, but particularly to those who know and love and can relate to life on the islands of the world; also to those with a penchant for the good life afloat in any form, for it covers cruising, racing, deliveries, yachts, big ships, dive boats, research vessels and just about anything that can float, and even some that sank or were washed aground. Again there is pause for philosophical refection at the end of each story which is followed by a work of lyrical verse introduced, as with the poems and songs of the first book, by a philosophical quote that sets the scene for the lines about to be read. 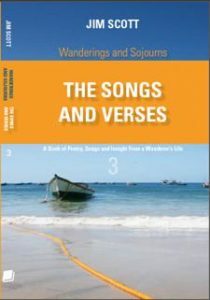 Book Three “The Songs and Verses” comprises over 80 poems and songs, some being favourites from the previous two volumes but many more that were never before in print that manifest themes untouched in books one and two. Some of these have already been put to music by various singers and song-smiths while others are yet lyrics awaiting an appropriate melody to complete them. Some are short and poignant while others, though not being categorized as epics, tell an entire story and span several pages. Here you will also find the love songs that are absent from its two predecessors. This volume combines many works of lyrical verse from three earlier, as yet unpublished, anthologies; Songs of Love and Loneliness, Songs of Life and Destiny, and Songs of the Open Road. 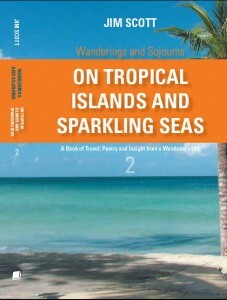 Not in the “Wanderings and Sojourns” series is a fourth book. “Time of the Seventh Fire”. A much larger book of a different genre that has been in the making for a number of years. This is an environmental novel with a powerful message for our present times of overexploited resources and horrifically short term ecological thinking. The story wraps around some very real and ancient Anish’naabe (Ojibwe) prophecies told in visions centuries before Columbus stumbled blindly upon North America thinking he had reached India. They foretold the environmental devastation industrialised society and the ensuing greed of those within it would wreak upon the world and how they/we would push the natural realm beyond sustainable limits. The book follows the journey of a modern day young man, very much a product of that world of selfish destruction, who finds himself unexpectedly caught up in the Old Ways of the Anish’naabe where he also finds a purpose for his own existence and future hope for all life. It is hoped this book will be available by summer of 2013.